The Netherlands are world leaders in the milk industry, in making crisps and in the world of bakeries. But did you know that The Netherlands is also a leading and progressive country with regard to developments in the Agri-Horti segment? And we must try to hold on to that. Among other things, by making greater efforts to improve hygiene in order to guarantee food safety. These factors are of influence on the fact that food production is taking place on an increasingly larger scale, which has resulted in increased risk. Unsafe food can have a much larger impact than was previously the case. The importance of producing food safely is therefore larger than ever before. Food production is taking place on an increasingly larger scale. As we said, this is due not only to the increase in scale and the growth of the world population, but also because the demand for local food from supermarkets is constantly increasing. These days supermarkets are striving to have a certain percentage of what they offer locally produced, and to meet this demand enormous greenhouse projects are ongoing everywhere. Because food production is taking place on such a large scale, viruses or bacteria that carry germs or diseases can have enormous consequences. For that reason it is important that the food chain takes more responsibility so that the safety of food will always be guaranteed. It is important to protect our produce the best we can and thus reduce the risk of unsafe food production as much as possible. Supermarkets have gone a long way already in the field of food safety. Very often they will only buy their food from suppliers who are certified and who comply with all the stringent hygiene requirements. For example HACCP, BRC and IFS certificates with which Agri-Horti companies can show that they are using a system that guarantees food safety. The more hygienically a product is treated the better the shelf life and food safety will be. Therefore In greenhouse complexes you see hygiene sluices much more often these days, so that employees and visitors can wash and disinfect their hands and clean their soles and thus go into and come out of the greenhouse clean. Through these precautions, the risk of diseases and bacteria is limited as much as possible. 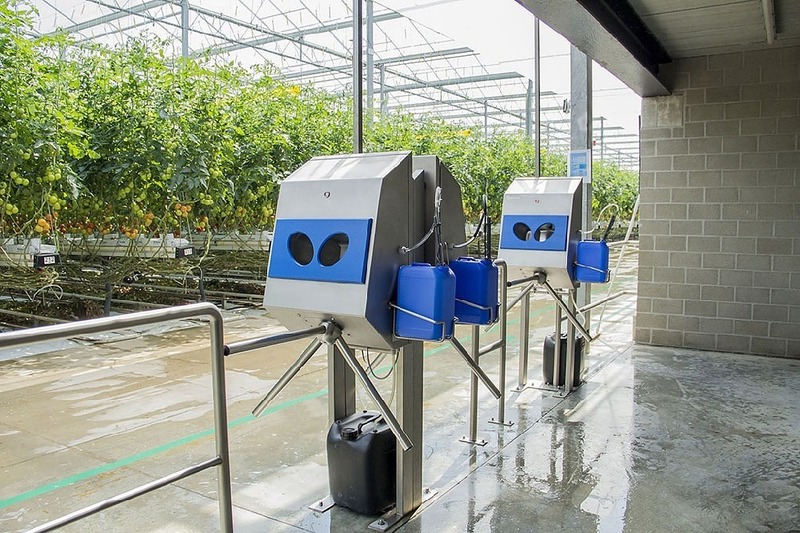 The hygiene requirements within the Agri-Horti segment has been taken to a higher level, and a hygiene sluice is definitely not an unnecessary luxury. In addition, all Elpress hygiene sluices are certified by HACCP International, which means they meet all their strict requirements in the area of food safety. If you would like more information about hygiene stations for the food industry and the associated possibilities then please feel free to contact Elpress. We are only too pleased to help you.